For more than a decade, numerous studies have documented the transient nature of HPV infection in young women. Although, up to 50% of adolescents acquire HPV in adolescence approx 90% will clear the infection, (31-33) with 79-90% clearing it within 24 months. Certain HPV types, such as HPV 16, clear more slowly than other high- or low-risk types and new infections are constantly occurring. There is evidence that having multiple types of HPVs also slow clearance (34). Whether this reflects a global defect in the immune response or whether multiple HPV types act synergisti-cally is unclear. The remaining 5-20% of women with persistent infections are at risk for developing HSIL (31,35,36). Rates of regression among older women appear to be less frequent; hence, detection of HPV in an older woman (defined as >30 years) most likely reflects an already persistent infection and an increased risk for HSIL. As with HPV, LSIL, and HSIL also regress at higher rates in adolescents compared with older women (37-39). Studies in adult women show that 60-80% of LSIL will spontaneously regress and 20-30% will progress to HSIL. In contrast, a recent study in adolescents and young women show higher rates of regression with 92% of women aged 13-22 years showing regression (40). 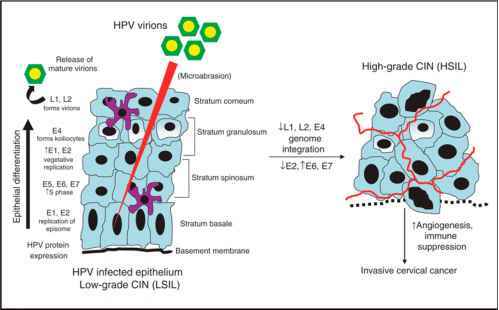 As demonstrated by these high rates of appearance and regression, LSIL appears to regress in parallel with HPV underscoring its benign nature in this population. The slower rate of regression of LSIL observed in older women compared with adolescents is most likely because of an infection that is already persistent. Persistence of viral infection has been shown in many studies to be necessary for the development of significant precancers, i.e., HSIL (31,35,36). Another reason may be that the chance of the LSIL being misclassified is higher (the lesion is actually HSIL) in the older women because the prevalence of histological HSIL is higher in this older age group. In more recent studies (41,42), about 80-90% of LSIL was shown to regress in adult women. The difference between the older studies and the more recent ones may be that the prevalence of certain behaviors differed, for example, smoking and use of high dose estrogen contraceptives that may have influenced regression. Actual progression rates of SILs remain unknown because all studies are time-limited. Cox et al. (43) showed that 12.8% of older women would progress from LSIL or ASCUS/HPV-positive to HSIL within 2 years (41,43). On the other hand, Woodman et al. (44) noted that 3% of HPV-negative and 7% of HPV-positive adolescents developed HSIL within 19 months of acquiring HPV. In a longitudinal study of adolescents and young women (40), only 3% of LSIL in adolescents and young women progressed to HSIL within 3 years. A retrospective chart review of adolescents less than 19 years of age with cytological LSIL found that 31% progressed to HSIL by 36 months (45). As this study involved chart reviews, it is not clear if the HSIL reflected new lesions or actual progression of LSIL. In addition, only a third of the original cohort was followed for 36 months. Studies of HSIL are few because carcinoma-? '« situ is part of what has recently been termed HSIL and there are ethical concerns in monitoring these lesions without treatment. Another problem with the interpretation of studies of HSIL are that this category subsumes the WHO categories of CIN 2 and CIN 3 and these lesions have different natural histories. Furthermore, CIN 2 is not a very reproducible diagnosis by pathologists. There is also debate as to whether CIN 2 behaves more like CIN 1 or more like CIN 3 (37). The importance of these differences for adolescents is that CIN 2 lesions make up the majority of HSIL whereas CIN 3 is less common (8,20). In a study of adult women, Syrjanen et al. (37) reported that 56% of CIN 1, 53% of CIN 2, and 14% of the CIN 3 lesions regressed. Progression rates were similar as 14% of CIN 1 and 21% of CIN 2 progressed in comparison with 69% of CIN 3. Nassiel et al. (38) found similar rates of regression for CIN 2 lesions, but with slightly higher progression rates overall (30%). Prevalence studies in adolescents in United States have consistently shown that adolescents rarely have carcinoma-?« situ and that invasive cancer is almost unheard of (8,20). According to the most recent Surveillance Epidemiology and End Results (SEER) statistics (1995-1999), the incidence of invasive cancer of the cervix was 0 per 100,000 for ages 10-14 years; 0 per 100,000 for ages 15-19 years and 1.7 per 100,000 for ages 20-24 (46). The 1.7 cases per 100,000 cases in the 20-24 year olds may have been in at risk populations, such as those with immunodeficiency disorders.